Depending on which analyst firm you believe, Windows 10 will either finally overtake Windows 7 this month, or it won’t. Either way, the newest OS is narrowing the gap. However, according to the Firefox Hardware Report, a public weekly survey of the hardware and software used by everyone running the release channel desktop build of Mozilla's web browser, Windows 10 still has a long way to go until it catches up to Windows 7. The Firefox Hardware Report, which is similar to Steam’s Hardware & Software Survey, shows that in the week up to January 7 2018, Windows 7 had a sizable 44.68 percent share. Windows 10, in comparison, is on 35.41 percent of systems, leaving a large gap of 9.27 percent to close. 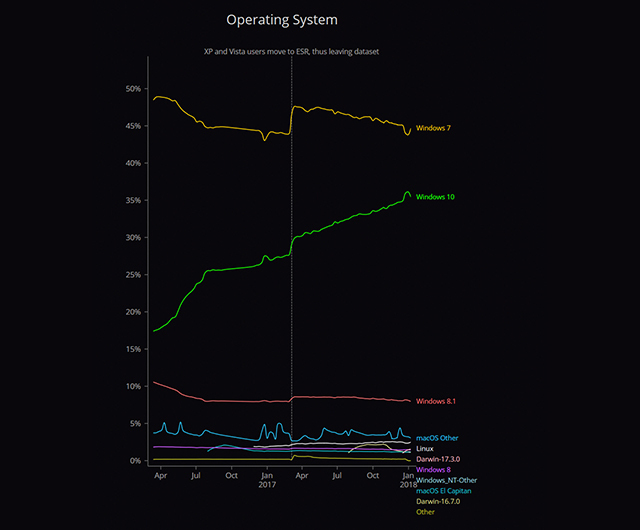 Windows 10 is gaining in popularity though, as can be evidenced in the graph above. Windows 8.1 is a very distant third, on 7.96 percent, followed by MacOS (Other) on 3.04 percent. As you can guess from the name, the Firefox Hardware Report doesn't only cover operating systems, it also records Graphics, Processor and Flash details. You can access the full report here.